Thomas Hauert created a new work for the prestigious ballet company housed in the Zurich Opera House. 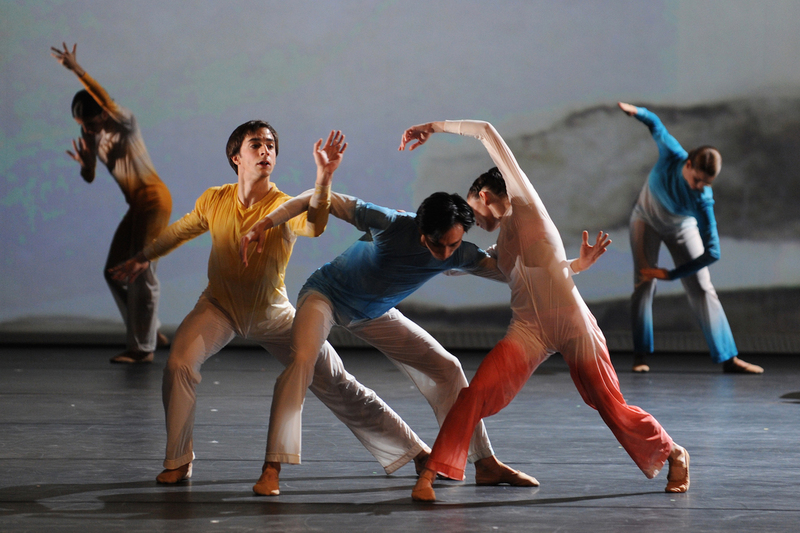 Having been given complete freedom in his choice of music, stage design, orchestra size and number of dancers, the choreographer opted to work with twelve of the Ballet’s dancers to music by Salvatore Sciarrino entitled Il Giornale della necropoli (2000). He also decided to involve the renowned Belgian artist Michaël Borremans, projecting one of his drawings on stage. Il Giornale della necropoli is composed as an encounter between three equally important elements: dance, music and visual art. An encounter of delicate, suggestive and sometimes dark tones. Constructed on principles of micro-variations in sound structures, Salvatore Sciarrino’s music is intimist, concentrated and refined. Writing about Il Giornale della necropoli, his piece for 69 musicians and solo accordion composed in 1999-2000, the Italian composer says that it offers a possible metaphor: “From the peaks of our skyscrapers, unease drifts down on us. Not all of us are in a position to accept it: that, sure, the City of the Dead, that’s us.” For Sciarrino, this music is a meditation on the transitory and, beyond that, on the very fact of being human. “Everything comes to an end. This is both terrifying and liberating. For along with the illusions, honours and lies, society’s impositions also disappear. (…) To think about the world from a future perspective also means to surmise its decline; that cities will appear and vanish in the desert. Put briefly, such a variety of unknowns as to discourage any enthusiasm. And yet change is the essence of life: why try to oppose it? Why freeze with fear? Those who resist change are denying themselves the true pleasure of life.” Thomas Hauert explains that despite the size of its orchestral formation, Il Giornale della necropoli is an extremely subtle piece of music interspersed with sudden explosions. It seems to scan with a regular pulse, like drops of rain or the hands of a watch. However there is no impression of moving forward; it feels as if time has been suspended, as if possible movement has been stifled or hampered: a tension between what is and what might be. With the artist Michaël Borremans too, there is something unfinished, something being stopped from developing. Playing with the modulations of a deliberately reduced chromatic range, as if at a virtual standstill, his enigmatic drawings seem to float between the past, present and future. It has been said that his art embodies time. Full of insinuations, there is a subdued uneasiness in his work which, at the same time, is strangely peaceful. The distinction in it between reality and imagination, the animate and inanimate, the living and dead is blurred – here too, it could be said there are dead-alive humans. Man often appears in his work on a minuscule scale, as if dwarfed. Without any apparent logic, these works acquire a universal dimension, appearing to enable us to feel our inability as individuals to have any influence on a complex world. They confront the spectator with “historical illusions” which form the basis of society today and the indifference of the world around us. In the course of their conversations, Thomas Hauert and Michaël Borremans decided to use an existing drawing which is projected onto the show’s backdrop. However, rather than offering a static image, the projection moves very slowly over the drawing, directing the spectator’s eye almost imperceptibly to a particular detail. A number of Borremans’ drawings, particularly the one chosen by Hauert, appear to be like a sketch of a project to be undertaken. “Futurist images in the past.” The artist says that he actually considers the drawings to be suggestions for interventions or installations in the public space: preliminary studies, however, that will never achieve “true” reality. The set for Il Giornale della necropoli appears more like a drawing of the set, a project suspended for ever in time, just like Salvatore Sciarrino’s music. If Hauert has chosen to confront his choreography with the work of Sciarrino and Borremans, it is because in both of them he finds a fragmented artistic language, without any linear development, communicating ambiguously while giving the spectator plenty of freedom. Their art explains nothing, but nonetheless makes itself felt. Both accessible and hugely profound, it is like a journey that confronts us with ourselves. According to Thomas Hauert, this is what attracts him to these works, what stimulates his imagination and feelings. He also feels that he is going back to his own way of creating and expressing himself through movement. Hauert’s creations are characterised by the richness of their vocabulary and their choreographic compositions based on the infinite possibilities of the human body rather than on pre-established aesthetic systems. Working here with brilliant dancers from the Zurich Ballet, he does not take away the classical vocabulary inscribed in their bodies, but on the contrary makes use of it, while also taking them in directions which, for them, are unaccustomed and even uncomfortable. Like Sciarrino’s music, he sees the choreography as vestigial, more as suggestions of movement to be imagined, sounded out and completed by the spectators. A restrained choreography, with a broken flow; a choreography, he reveals, whose most dynamic element could be in the look of the spectators rather than in the dancers’ bodies.